We Deliver all of Your Garden Plants - Free! Note our free delivery areas covers most of the UK (type your postcode into our delivery checker on the left to see if you are in our free delivery areas). Roughly our delivery areas are England, Wales and Scotland. We despatch your order for you from March right through to late October as this proves to be the very best time for planting as light levels are increasing and the ground temperatures are rising after winter - if you select a plant order during November to February we will allocate the stock for you and despatch during our normal despatch period. ARE DELIVERED AT COST BY WEIGHT. Cost of delivery will be calculated as you shop and will be shown at the top of every page along with the cost of the items in your basket so you will always know how much you are paying before finally checking out. You can also use our Delivery Guide Table below to forecast your delivery costs. How to use the Delivery Table Guide. Select the number of hanging baskets and/or patio containers you plan to buy, then select the number of accessories you plan to buy. Then reading down and across from those numbers where those number meet is the cost of postage. Example 1: If you plan to buy 3 hanging baskets and 0 accessories it will cost �.98 delivery. Example 2: If you plan to buy 3 hanging baskets and 3 accessories it will still cost �.98 for delivery. 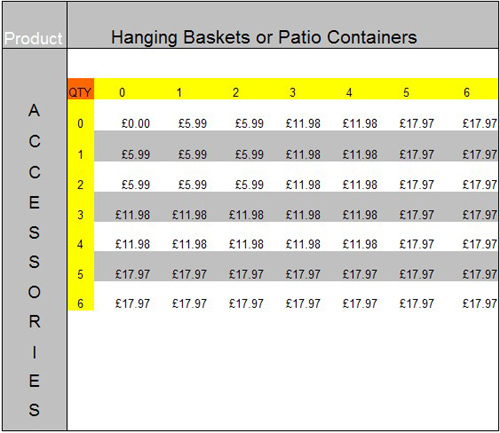 Example 3: If you plan to buy 3 hanging baskets and 5 accessories it will now cost �.97 for delivery. Signatures for delivery, maybe required by some of the courier services.